He rang me back the same day and offered to bring the water the next day. $160 for 13,000 litres. 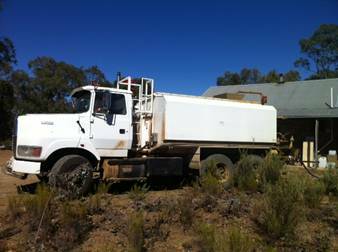 Warrick’s is a 13,000 litre water truck, perfect for the Bushlands gravel roads and driveways. Most of the Bendigo region water carriers use 19,000 litre semi trailers. Water is extremely heavy per volume and these semis can slip and wheel-spin when our roads are dry and the top surface loose. Warrick had no trouble at all coming up Commissioner’s Gully/Goldspeck Gully Road and my driveway. Within minutes he’d backed up to about 10 metres from my tank and the water was flowing in. 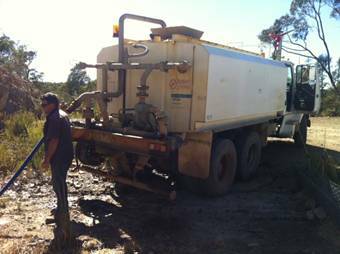 Warrick can also supply bore (non drinking) water for pools and gardens. Warrick is a pro and very experienced. 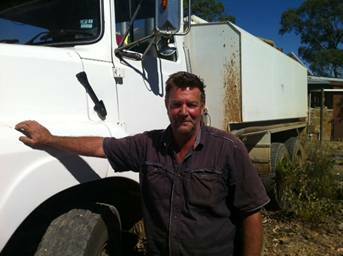 He was a contractor on the construction of the Calder Highway for two years and is an MAS contractor to grade local gravel roads, including the roads in the Bushlands. (The water is used for compaction and dust control during the grading process). He knows the Bushlands well. Warrick was the lead/rhythm guitarist for 80’s hit aussie band Goanna, which specialised in social protest songs/popular music such as Let The Franklin Flow. He also produces chemical-free, juicy garlic. $20 a kg! A true friend of the Bushlands. A great service. This entry was posted	on Monday, January 14th, 2013 at 11:19 pm	and filed under • Sharing, Recommended suppliers. You can follow any responses to this entry through the RSS 2.0 feed.